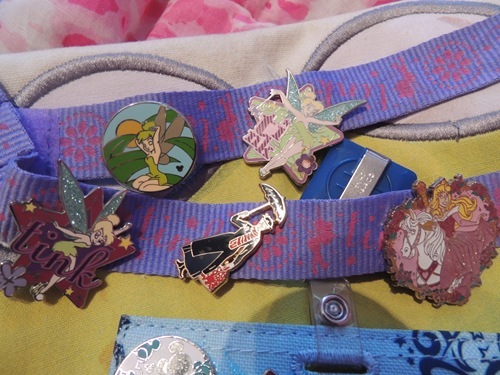 If you’ve been to Disney World or Disneyland, you’ve probably noticed that the cast members where lanyards or belt attachments with Disney themed pins on them. You can also buy pins throughout the parks. On our trip in January, I made a bit of a mistake when I bought Gabbie a starter set of pins. The sets can get expensive! My recommendation to someone starting out is to buy pins on ebay or at the Disney Outlet before you leave for your trip. Then, start the search for trades with cast members! 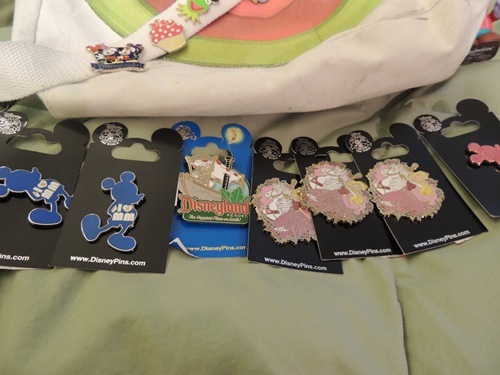 I really was curbing my wish to buy everything in Downtown Disney by asking various cast members to see their pins and trying to find the pins we wanted. 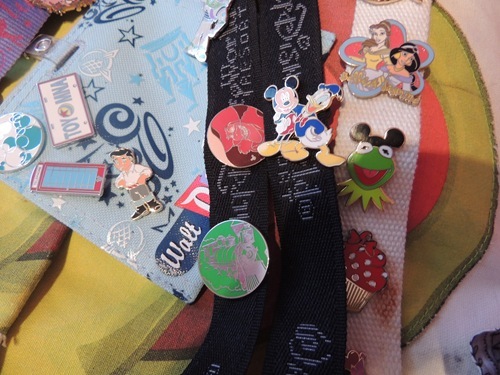 You choose which pin you want from a cast member, and you choose which of yours you give them. 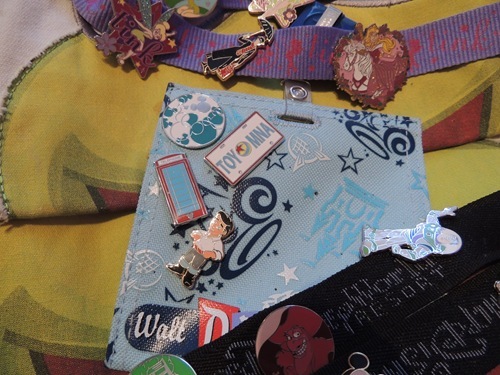 You don’t even have to enter the parks to pin trade – I did it at Downtown Disney and the resorts. I even found out that the Swan and Dolphin hotels Disney Gift shops have pin boards – more options to pick from! Here are the pins we started with. By we, I mean me, Gabbie, and Zachary, because I was pin trading for them too! This is my bag, where I wear my favorite pins. 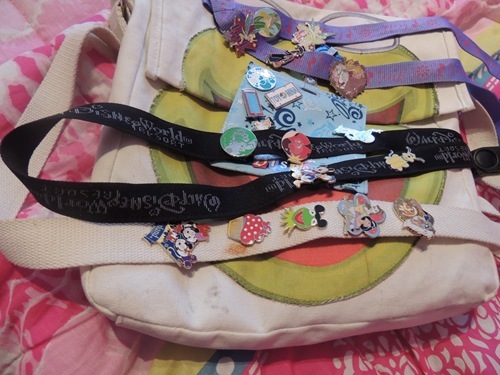 I ended up keeping all of these, and even put locking backs on the Minnie cupcake and the Lion King pin – which a lot of people liked and asked me about! The Kermit pin has always been a keeper. It was my first pin trade and I plan to keep it! I was willing to trade the princess pin for another multiple princess pin, but I didn’t find any. 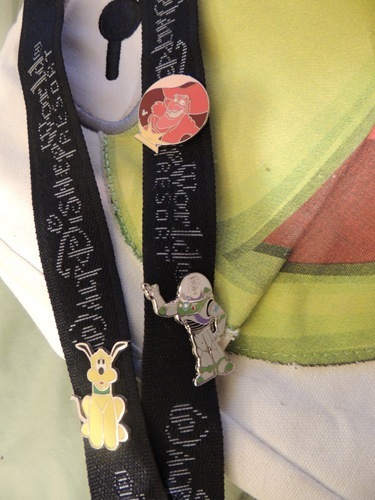 I was also willing to trade the Disneyland pin for an equivalent Disney World pin, but again I did not find anything. These are Zachary’s pins. His keeper is Buzz. He traded for Pluto and Captain Hook in January. He also had a Mickey Mouse pin that disappeared. He sometimes says he doesn’t want to keep Captain Hook, but Captain Hook is one of the Hidden Mickey pins that you can’t buy, you can only trade for them, and it is from 2007! This is the handful of pins we bought at the Disney Outlet in Texas! We bought them with plans to trade them. We ended up keeping one of the Aurora pins because Gabbie decided she liked it when I was showing her the pins over Face Time while we were at Disney! These are Gabbie’s pins. 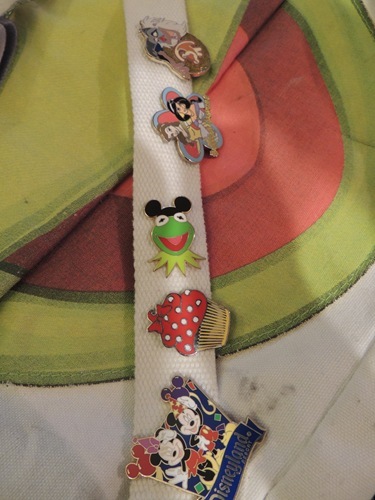 Her starter set came with 4 Tinkerbell pins and she still has 2 of them! Mary Poppins is her keeper pin. She asked me to trade her Minnie Mouse for something else. 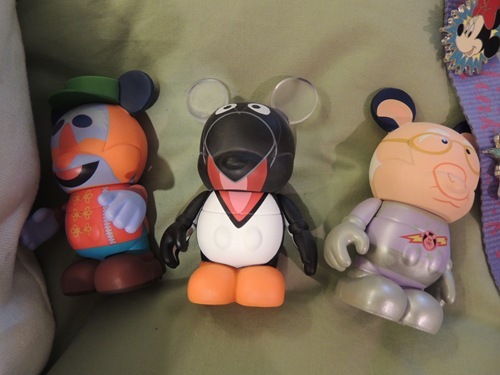 These are the Vinylmations that I brought with me to trade. I got these 3 at the Disney Store in our local mall, on clearance. I liked them ok, but was willing to see what better I could find. 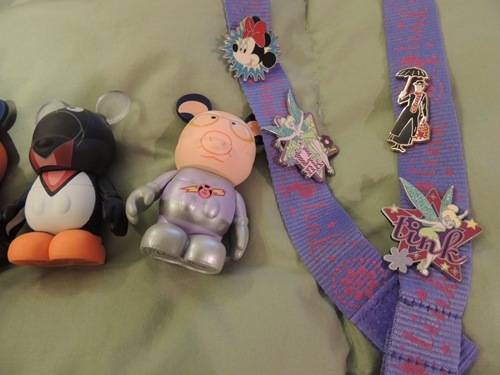 Vinylmation trading is a little more complicated than pin trading. In some places they have clear boxes that you can pick from; in other places there are mystery boxes where you pick a number and then you are shown what Vinylmation is behind that number. I was told in multiple places that I did not have to accept the offered Vinylmation if I didn’t want it, but in one store I was told that I had to take the one I was shown. (I didn’t anyway!) I just now checked the rules and I don’t see anything about being required to trade once you see your pick. You can also trade Vinylmation at many Disney Stores – my local store brought out a huge box for me to sort through one day! Here are the pins I came back with! The blue holder is what I was using to keep my pins on. I am working on a way to display my pins! I picked a teal Mickey Mouse head pin, a Toy Mania license plate pin, an England phone booth pin, and a baby Prince Eric pin for myself. For Gabbie I picked the round Tinkerbell pin on the top of this picture, and ended up keeping the Aurora carousel pin for her too. And for Zachary I found a green train pin (he loves trains!) and a Mickey and Donald pin. 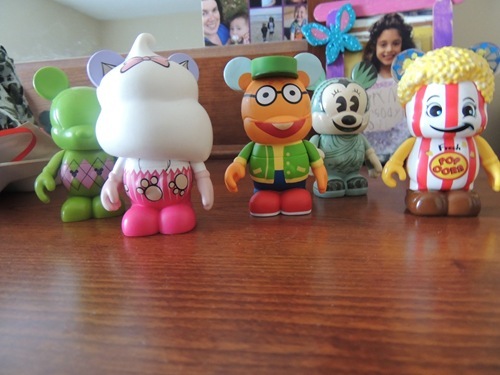 My Vinylmation guys! The back green and pink argyle was the one I picked from the box at the Disney Store, and I got the Minnie Statue of Liberty in NYC. The front 3 are the ones I trade for on this trip – a cupcake head Marie, Scooter (had to keep at least one Muppet! ), and Popcorn. Have you ever pin traded? Do you like my choices?